Our DF range of Hot Wire Strip Heaters provides maximum flexibility, fast setup and quick and efficient heating. 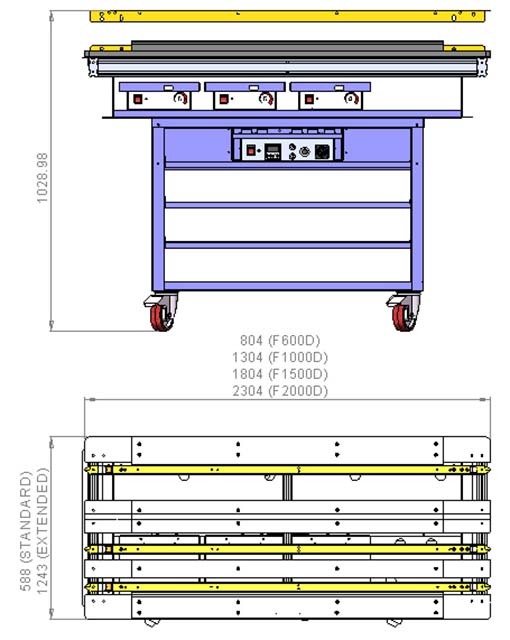 Supplied in working lengths of 600, 1000, 1500 and 2000mm, machines can be fitted with up to four heating beams. Modules are kept in stock for quick delivery of machines tailored to your requirements. Heater beams are only 30mm wide, allowing close-centre bends to be produced with ease. Heater beams are fitted with twin wires above and below the material for fast heating of materials up to 10mm in thickness. Calibrated adjustments ensure easy and repeatable setup. Different combinations of wire spacings, heights and wire power can be used to produce the best results on most materials. The Upper Heating Beams are operated by low-pressure pneumatic cylinders, for safe operation and easy loading and unloading of material. The cycle time is controlled through a control unit with digital timer and foot and panel start and stop operation. Heater Beams are powered from low-voltage Power Packs with variable power control. This enables heating wires to be adjusted to exactly the required output for the material being processed. We use one Power Pack per heater beam so that each beam can be adjusted or isolated individually, for maximum flexibility. 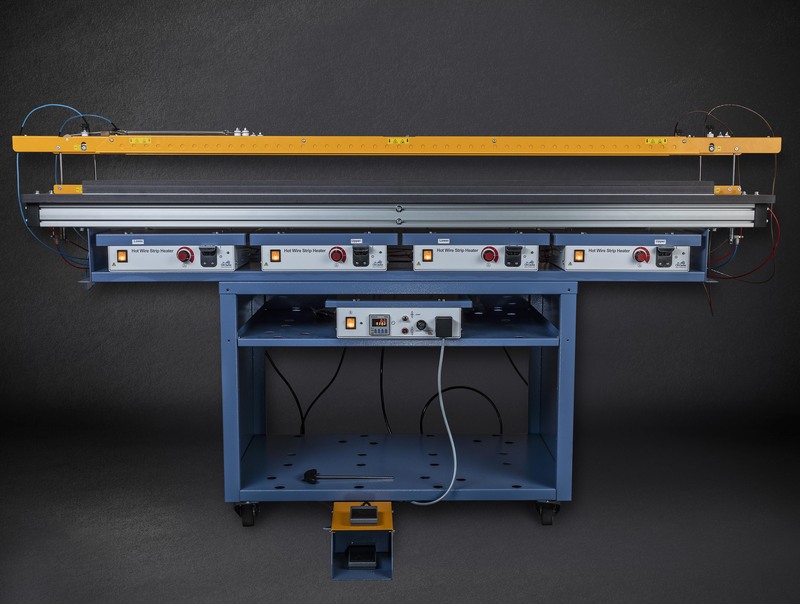 For multi-beam machines on stands, we offer a power distribution centre in either 16 or 32 Amp capacity, neatly splitting the power coming into the machine to the individual Power Packs. The Support Slats on the F…D range are made from high grade fibre board, ensuring that they are long-lasting and gentle on the material being processed. Support slats are securely fastened in place and can be easily moved as required. 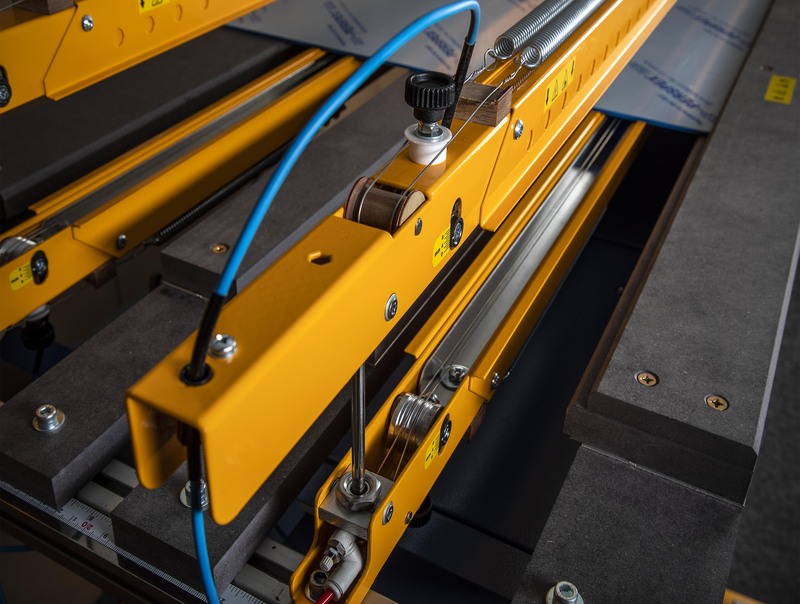 The front support slat also incorporates the workstop, and this is positioned to allow the side calibrations to be used for both stops and heater beams for ease of setup. All F..D range machines are supplied on a stand with lockable castors. This allows machines to be easily positioned in the workshop. Copyright © 2017 C R Clarke & Co (UK) Limited. All rights reserved.